In my previous post, I did a how to make cube shaped & pyramid shaped hard boiled eggs. (see “how to mold a hard boiled egg”)It was a lot of fun making the molds, but some of you must be thinking “Yeah, but that’s a lot of work to make a mold for a hard boiled egg…” and I completely agree. I’m just a nut. So I’ll show you a very easy & popular method to mold a hard boiled egg in Japan. 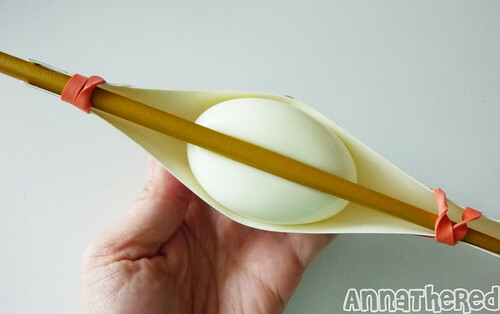 It’s hard to see but you want the chopstick to dig into the egg. You can put them in the bento just as they are. Or you can cut the bottom of the egg to make them stand. This is great for beginners of both kyaraben makers and eaters. It doesn’t require any special technique or ingredients. Also I think it can be awesome finger food at a party. You don’t need a special mold so you can make a lot of them at the same time. Put seasoning on the top like salt, egg, ketchup, anything to dress them up or you can make deviled eggs with them. It’s easy, and a delicious way to tell someone how much you <3 them. If you have any questions about any of my how-to’s, please feel free to leave a comment or email me at AnnaTheRed[at]gmail.com! I wonder if it would work with an elastic band around the bottom of the egg to make the ‘mushroom button’…. although it might have to be a rather large (wide) elastic band. uh, wouldnt ur egg get the rubber band smell n taste if u do that?? Jeff, I don’t think the elastic band would work, though Willowlove’s suggestion seems plausible! Well maybe you can take 2 round chopsticks and do the same basic idea, except on each side about a quarter down the egg….and then it might look like a mushroom? can hard boiled eggs last at around 28 to 32 degrees for two or three hours? Are you trying to freeze the eggs in the freezer? If so, I can’t tell you for sure since I’ve never done it, but I’ll usually keep hard boiled eggs in the fridge for a few days and they’re fine. I think 28 to 32 degrees is referring to Celsius temperature, which would be (I’m guessing) around 80-90 degrees Fahrenheit. Heart-shaped eggs? Wow, this is fantastic! I have never seen anything like this. Who knew?! AWESOME! If only I’d gotten up early enough to see this and make some for my love. This is the coolest thing I’ve seen in weeks!!! This is such a sweet way to craft an egg. very creative! well done! That is absolutely awesome! I only wish I saw this a few days ago. How do you cut them. You can just cut it like a regular hard boiled egg. If you’re interested, look me up at FACEBOOK. Anna: LOVE the egg idea. Love it. Makes you almost forget about the cholesterol, haha! I love this post and your site! I love making bento boxes and now that I’m a vegan I have to use different ingredients/methods at times – but it’s the spirit that counts I guess. I am so impressed. You are amazing. I will definitely try this. This is so cute…I would like to feature this post in my blog and share with my friends if you don’t mind. Please let me know if you are ok with it. Thks. love from Malaysia! Sorry for the late reply! And yes! Of course you can post it on your blog. Thanks!! I’m making bentos for my little sister, my best friend and myself right now, and am so putting one of these in each! They’re so cute. AHHH THIS IS SO CUTE!! THANK YOU FOR SHARING!! This is so cool! I found this post via http://savoringtoday.com! Kevin, you are such a nice guy, thanks for the shout out! I made some this morning for my 6 yr old son. He loves eggs! Love your website. Thank you! an absolutely perfect idea to refresh recipe of boiled eggs, i must say. thank you for your share and looking forward to further blogs. may be you can try with how to make fried eggs in heart shaped too. nice work!! !… well i was wondering if we could do the same to an ostrich egg? make the heart shaped BIGGER! I guess I need to find a girlfriend that likes hard boiled eggs. There’s some facebook group that shared your images without crediting and put their own watermark on it. Along the line you made with the chopstick? I’m a dope and am trying to visualize this… I’m sure I would figure it out after trying it but just wondering! Which part are you confused about? Let me know which step you’re talking about, and I’ll help you! We aren’t a very “romantic” couple. I suggested the best thing would be to go to an electronics store and build a computer that night. And then watch some geeky movies. I think showing up to his place with a plate of heart shaped deviled eggs would be just romantic and cheesy enough for us. It makes me sad that someone from thailand stole this idea and presented it as her own (with your exact pictures) =[ love your work! so cute, so glad i found this for valentine’s day lunches! YAY!!! I tried this and it worked! I’ll be sharing your link on my blog! Thank you! I love your ideas! I love how art has sooooo many different styles! thanks for sharing! keep up the good work…hugs from Texas! Such fun. I practiced the heart-shaped eggs this a.m. so I’m ready for next week. The dimensions of the cardboard \V\ are important for getting the right shape — 1.5 inches per side, 3 inches total, not 3 inches per side. My first practice egg came out more like sharp mountain peaks because the top of the egg was completely within the carton rather than free to remain curved on top. It’s great, is it ok for you if I post it in my blog? You made my YEAR. LUV it! This is fab! Love it. What an adorable and easy idea! Love it – thanks so much!!!! A friend just linked me to this post and I made these heart eggs for my hubby’s Valentine’s Day breakfast. You can see that post here. Your tutorials are helpful and your bentos are outstanding. I’d also like to invite you to participate in a site I run called Bento Blog Network. We have a weekly themed bento meme. The meme starts on Friday and runs through Tuesday with voting for favorites on Wednesday & Thursday. The bento with the most votes is featured for the following week. Thank you so much for this adorable idea! I tried to make my version today! Sorry for the late reply! Your egg looks absolutely adorable! 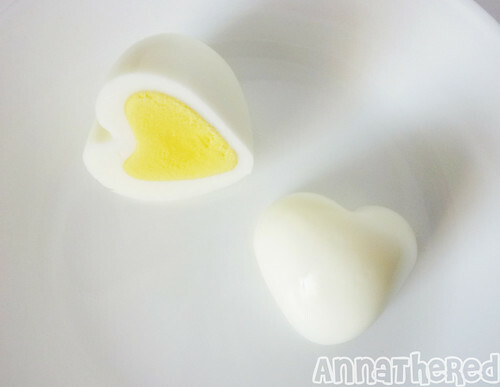 Is it okay if I put a photo of your heart shaped egg on the “your food” page on my blog, linking back to our blog? My favorite new blog. I love hard-boiled eggs, and the cuter the better! This is the most fun food thing I have seen in a very long time. What talent. I must say, I don’t usually leave comment on ppl blog. But yours is exceptional. 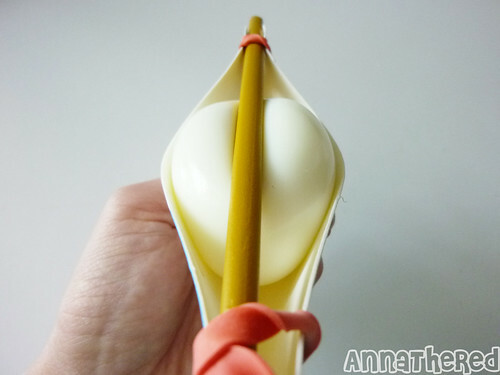 Your love shaped egg idea, have given me idea of what to make for my wife on Valentine’s Day! She loves it soo much! I put the egg with japanese bento. ) thanks for your help! This is SO adorable!! At first I thought I couldn’t do it, but then I tried and it turned out perfect!! THANKS!!!!! Wow!! It’s so adorable. Will u please send other updated decorations to my email every week? Thanks! Love it! It’s incredible what we can do with what we have at home. Finally, i understand how this heart shape egg works. Thanks for sharing. .
OMG looks so cute… I must make this for my mum. .What kind of carton do I use? How to cut it open? great idea my kids loved it. But i added an extra touch. put red food coloring in to dye the eggs into pink heart shaped eggs. Je viens d’arriver sur cette page en suivant le lien depuis le blog Tezukiri.canalblog.com et je vais diffuser, sur mon blog personnel, votre recette pour faire des oeufs en forme de coeur. Je programme cette recette sur mon blog pour une parution le 13 fÃ©vrier prochain, veille de la St Valentin. Bien sÃ»r, votre nom et les coordonnÃ©es de votre site sont mis en lien. Je ne donne pas la mÃ©thode mais je renvoie mes lecteurs vers vous. J’espÃ¨re que cette procÃ©dure vous conviendra et je vous remercie pour cette belle et bonne idÃ©e. Bien cordialement ! I know it’s been forever since you posted this, but! I’ve seen things like this before and they always say to peel the eggs while they’re still warm. How do you do that? Do you dunk the eggs in ice water then peel? I’ve had some trouble trying to make boiled eggs …. Love this tip! I’d like to use it in my Swedish blog for Valentine! I will of course link back to you as the source of the tip and pictures. Hope this is OK. Thank you! Wow, this is sweet! Thanks for sharing all the awesome tips here. I’m new in bento making and I’m glad to chance upon your blog. 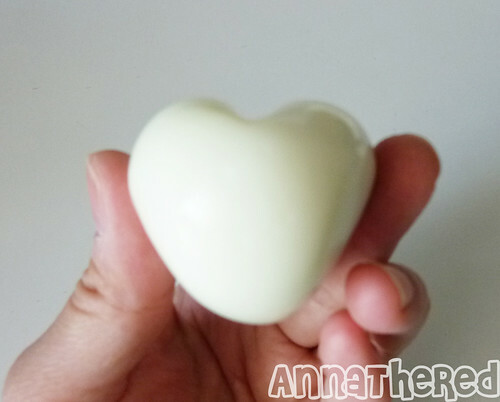 I’ve a heart-shaped mold but I always can’t find an egg that fits it to come out nicely. This is a better idea and can be used on eggs of any size! Help! I tried this (twice) and the egg cracked as soon as it was squeezed just a little. What am I doing wrong? Freshly boiled eggs are very flexible and I’ve never had my eggs crack. Was the egg freshly boiled? (Molding has to be done when the egg is still warm.) Was the egg properly hard boiled? 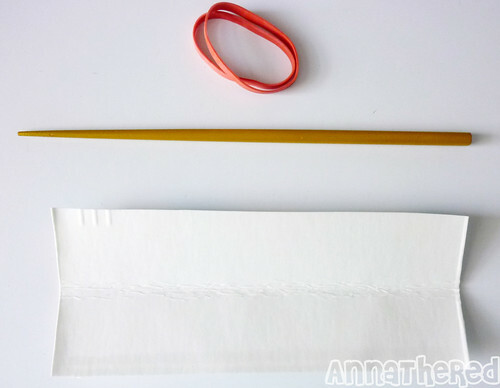 Does the chopstick (or anything you’re using) have a sharp edge? Hope you’ll get a pretty heart shaped egg! I was searching for a way to make my 4 children valentine day special and I ran across your page on heart sharped eggs, I just wanted to let you know – Wow, What a wonderful idea and so simple. I have chickens and have loads of eggs, and having all [growing ] boys, food is always a hit, so thanks for sharing this elegant, simple ideas. I didn’t see if anybody suggested immersing your heart-shaped egg(s) into a container of beet juice, to dye the eggs red. I used to do this with regular hard-cooked eggs, and also put in some apple cider vinegar for red pickled eggs. Yum. Gracias! thank you very much for the nice post & tuto, hope you don’t mind that I posted in my blog as I think it is very original, so hope you will receive some spanish visitor at your blog, if you would like to visit it: http://casabelenvejer.blogspot.com.es/. Best wishes and good luck with your nice blog. tried without your encouragement. You are a gem. To your good health, and long success. C. Mc. To make a boiled egg look like a plum, peel the egg when iit is hot. 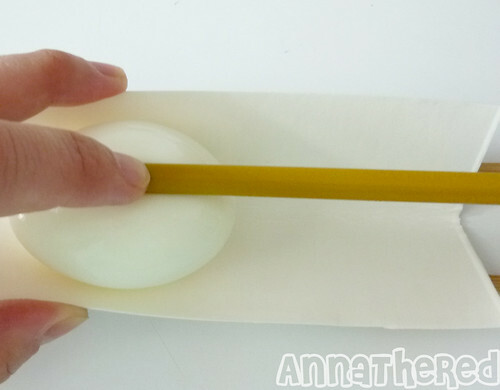 Grab the egg on the ends and squeeze with two fingers and continue holding in a bowl of ice water for 30 seconds. Release into a chilled bowl of pickled beet juice. You can store these eggs in the refrigerator in the juice until ready serve. When ready to serve make a hole in one end with a toothpick to place a parsley leaf. You can serve on a chef salad or with your pickled beets. My first born [ a girl] was born on Valentines Day.- I am still looking for new ways to give her hearts!! [she is 57 - how the years have flown] She lives in Canada now – I intend to send her a copy of your blog. I usually do not read blogs – but I will be returning to yours. Thank you for helpin g me find another way to send hearts to my daughter. My father was an executive chef,, and he could do the neatest things with hard boiled eggs. First they needed to still be very warm, and you have to work very quickly. Peel the egg under cold running water -be sure you get the “skin” or silver-then between your two flat hands, start rolling the egg in different directions. Before your eyes the egg will start to shrink. He would take a toothpick and barely prick “pock” marks then dye place the eggs in red or orange food die and create miniature strawberries (this is where you need to watch the shape your egg is taking and adjust the rotation accordingly) and oranges. Wow! Does this really work? If so, they are really cute!!! at my house and am thrilled with this. Even though it cracked open a bit, I did put them in refrigerator, but they came out pretty well. The heart shape was still visible good enough. Any tips for not cracking the egg when you tie it up in the carton? I used normal elastics for it. Heart-Shaped Eggs « Yow Yow! 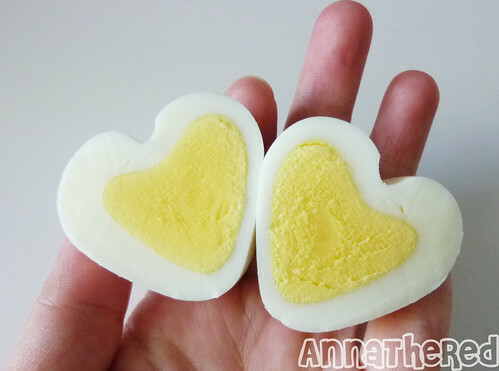 Lovemade » how to make heart-shaped eggs! Ð“Ð¾Ñ‚Ð¾Ð²Ð¸Ð¼ÑÑ Ðº ÐŸÐ°ÑÑ…Ðµ – ÑÐ¹Ñ†Ð° « thetasteofIT! KÄ pagatavot vÄrÄ«tas olas sirds formÄ? 22 Unconventional Gifts To Show Someone You Love Them « ã‚·æœ€æ„›é²åˆ°.! 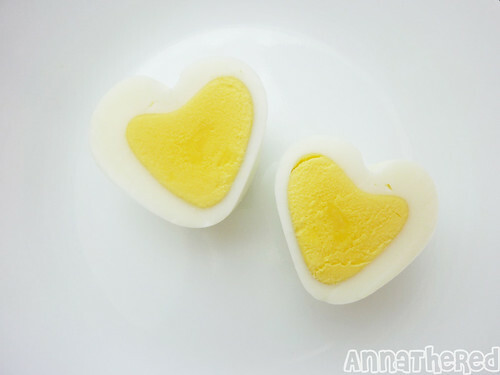 How To Make Adorable Heart-Shaped Eggs! Father’s Day Treat: Heart-Shaped Eggs! | CraftyChica.com | Official site of award-winnning artist and novelist, Kathy Cano-Murillo. Heart-Shaped Eggs! | CraftyChica.com | Sparkly, artful inspirations by artist and author, Kathy Cano-Murillo. 22 Unconventional Gifts To Show Someone You Love Them | The Usual Sources – Where You Are The Source. Creative Valentine's Day Ideas - Food Edition!